Download "AUTOMATIC LPG BOOKING, LEAKAGE DETECTION AND A REAL TIME LPG MEASUREMENT MONITORING SYSTEM"
1 AUTOMATIC LPG BOOKING, LEAKAGE DETECTION AND A REAL TIME LPG MEASUREMENT MONITORING SYSTEM R.Padmapriya, E.Kamini, IV Year Electronics and Communication Engineering, Arunai College of Engineering,Tiruvannamalai. 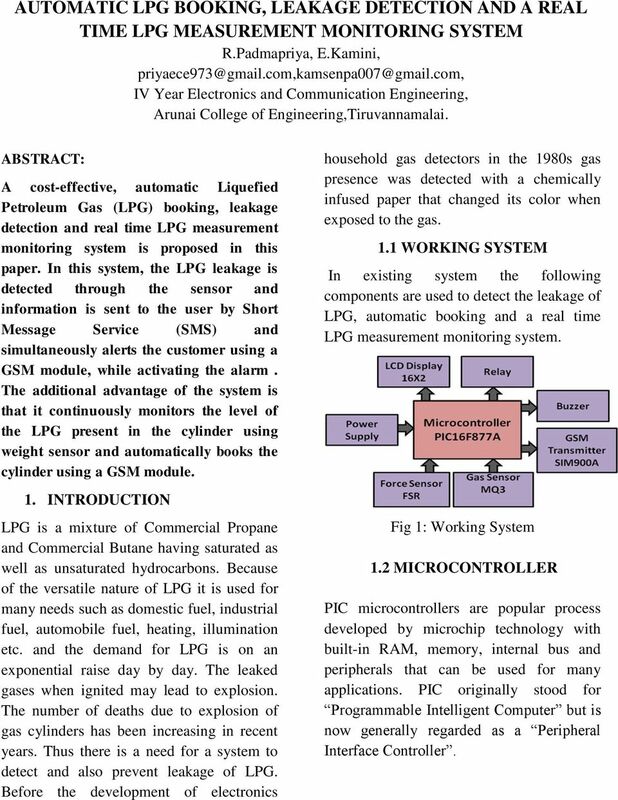 ABSTRACT: A cost-effective, automatic Liquefied Petroleum Gas (LPG) booking, leakage detection and real time LPG measurement monitoring system is proposed in this paper. In this system, the LPG leakage is detected through the sensor and information is sent to the user by Short Message Service (SMS) and simultaneously alerts the customer using a GSM module, while activating the alarm. The additional advantage of the system is that it continuously monitors the level of the LPG present in the cylinder using weight sensor and automatically books the cylinder using a GSM module. 1. INTRODUCTION LPG is a mixture of Commercial Propane and Commercial Butane having saturated as well as unsaturated hydrocarbons. Because of the versatile nature of LPG it is used for many needs such as domestic fuel, industrial fuel, automobile fuel, heating, illumination etc. and the demand for LPG is on an exponential raise day by day. The leaked gases when ignited may lead to explosion. The number of deaths due to explosion of gas cylinders has been increasing in recent years. Thus there is a need for a system to detect and also prevent leakage of LPG. Before the development of electronics household gas detectors in the 1980s gas presence was detected with a chemically infused paper that changed its color when exposed to the gas. 1.1 WORKING SYSTEM In existing system the following components are used to detect the leakage of LPG, automatic booking and a real time LPG measurement monitoring system. Fig 1: Working System 1.2 MICROCONTROLLER PIC microcontrollers are popular process developed by microchip technology with built-in RAM, memory, internal bus and peripherals that can be used for many applications. PIC originally stood for Programmable Intelligent Computer but is now generally regarded as a Peripheral Interface Controller. 2 2. RELAY A relay is an electrically operated switch. Current flowing through the coil of the relay creates a magnetic field which attracts a lever and changes the switch contacts. The coil current can be on or off so relays have two switch positions and they are double throw (change over) switches. Relays allow one circuit to switch a second circuit which can be completely separate from the first. For example a low voltage battery circuit can use a relay to switch a 230V AC mains circuit. There is no electrical connection inside the relay between the two circuits, the link is magnetic and mechanical. suspended in matrix. The particles are submicrometer sizes, and are formulated to reduce the temperature dependence, improve mechanical properties and increase surface durability. Applying a force to the surface of the sensing film causes particles to touch the conducting electrodes, changing the resistance of the film. As with all resistive based sensors, force-sensing resistors require a relatively simple interface and can operate satisfactorily in moderately hostile environments. Compared to other force sensors, the advantages of FSRs are their size (thickness typically less than 0.5 mm), low cost and good shock resistance. However, FSRs will be damaged if pressure is applied for a longer time period (hours). A disadvantage is their low precision: measurement results may differ 10% and more. Fig 2: Circuit Diagram For Relay 3. 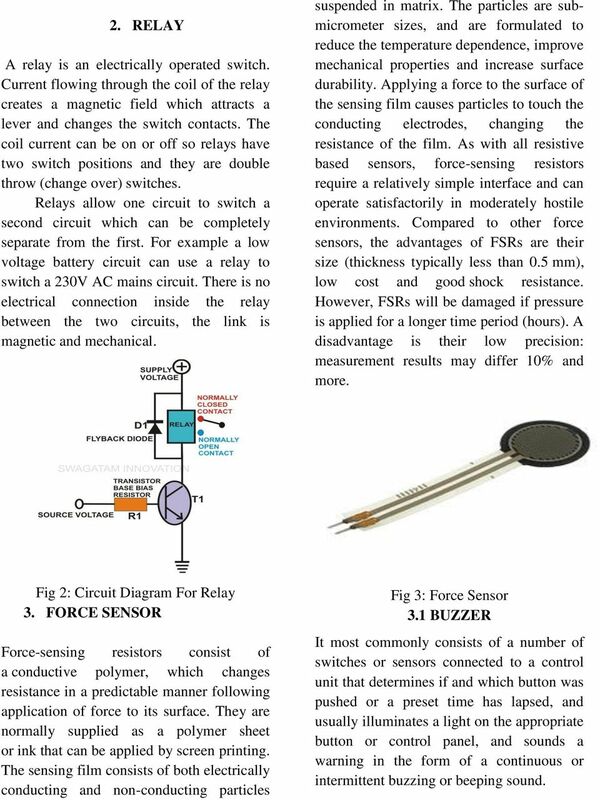 FORCE SENSOR Force-sensing resistors consist of a conductive polymer, which changes resistance in a predictable manner following application of force to its surface. They are normally supplied as a polymer sheet or ink that can be applied by screen printing. The sensing film consists of both electrically conducting and non-conducting particles Fig 3: Force Sensor 3.1 BUZZER It most commonly consists of a number of switches or sensors connected to a control unit that determines if and which button was pushed or a preset time has lapsed, and usually illuminates a light on the appropriate button or control panel, and sounds a warning in the form of a continuous or intermittent buzzing or beeping sound. 3 4. POWER SUPPLY CIRCUIT: Voltage regulator ICs are available with fixed (typically 5, 6, 8, 9, 10, 12, 15, 18 and 24V) or variable output voltages. They are also rated by the maximum current they can pass. Negative voltage regulators are available, mainly for use in dual supplies. Most regulators include some automatic protection from excessive current ('overload protection') and overheating ('thermal protection'). Many of the fixed voltage regulators ICs have 3 leads and look like power transistors, such as the V 1A regulator shown on the right. They include a hole for attaching a heat sink if necessary. resistance to disturb of gasoline, smoke and vapor. The sensor could be used to detect alcohol with different concentration, it is with low cost and suitable for different application. 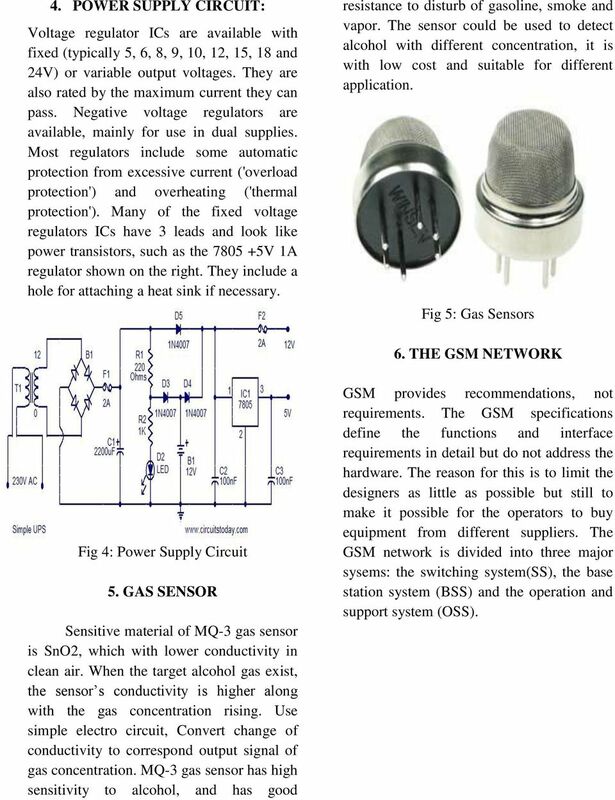 Fig 5: Gas Sensors 6. THE GSM NETWORK Fig 4: Power Supply Circuit 5. GAS SENSOR Sensitive material of MQ-3 gas sensor is SnO2, which with lower conductivity in clean air. When the target alcohol gas exist, the sensor s conductivity is higher along with the gas concentration rising. Use simple electro circuit, Convert change of conductivity to correspond output signal of gas concentration. MQ-3 gas sensor has high sensitivity to alcohol, and has good GSM provides recommendations, not requirements. 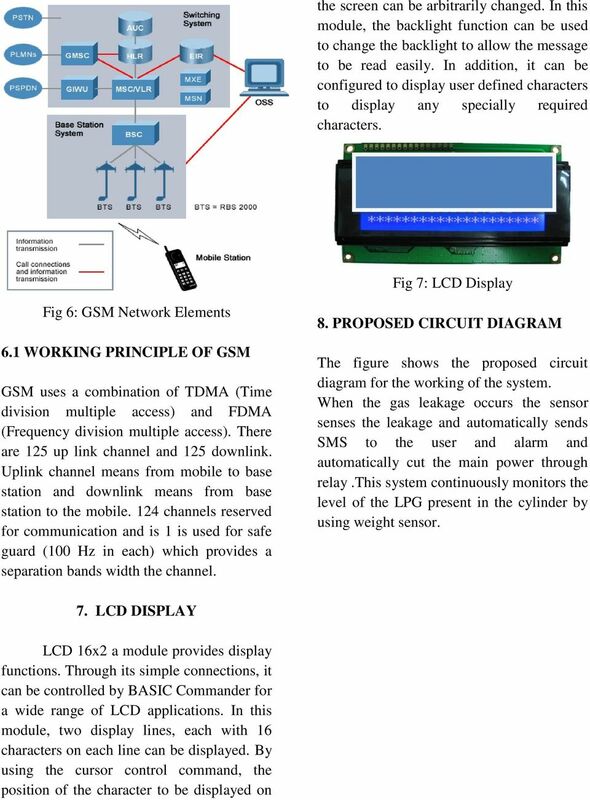 The GSM specifications define the functions and interface requirements in detail but do not address the hardware. The reason for this is to limit the designers as little as possible but still to make it possible for the operators to buy equipment from different suppliers. The GSM network is divided into three major sysems: the switching system(ss), the base station system (BSS) and the operation and support system (OSS). 5 involved in developing the system is significantly low and is much less than the cost of gas detectors commercially available in the market. 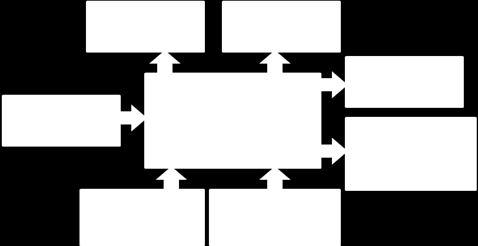 Fig 8: Proposed Circuit Diagram 9. FUTURE WORK In future the system can be expanded to many applications. The sensor used to detect the gas leakage also used to detect alcohol consumed person and smokers in the petrol bunks If the smokers found in the petrol filling stations they could be immediately send out from the place and along with the fire accident prevention public safety can be maintained. 10. 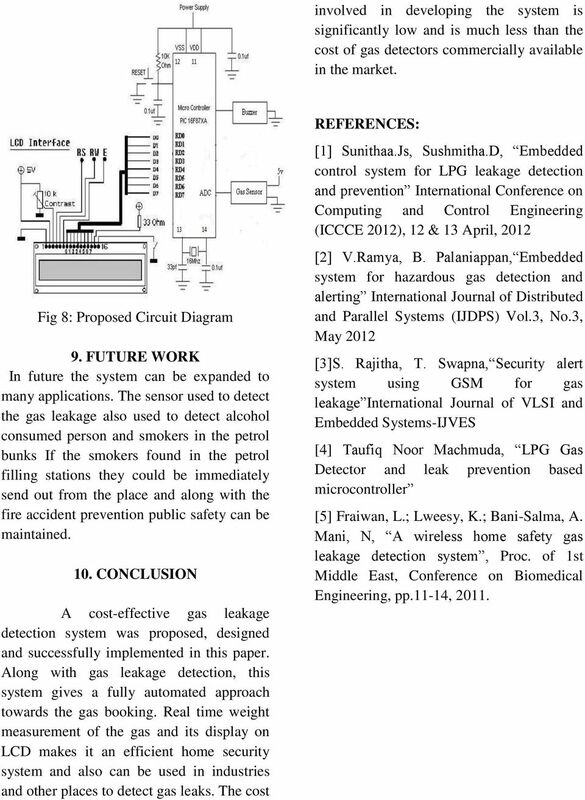 CONCLUSION A cost-effective gas leakage detection system was proposed, designed and successfully implemented in this paper. Along with gas leakage detection, this system gives a fully automated approach towards the gas booking. Real time weight measurement of the gas and its display on LCD makes it an efficient home security system and also can be used in industries and other places to detect gas leaks. The cost REFERENCES:  Sunithaa.Js, Sushmitha.D, Embedded control system for LPG leakage detection and prevention International Conference on Computing and Control Engineering (ICCCE 2012), 12 & 13 April, 2012  V.Ramya, B. Palaniappan, Embedded system for hazardous gas detection and alerting International Journal of Distributed and Parallel Systems (IJDPS) Vol.3, No.3, May 2012 S. Rajitha, T. Swapna, Security alert system using GSM for gas leakage International Journal of VLSI and Embedded Systems-IJVES  Taufiq Noor Machmuda, LPG Gas Detector and leak prevention based microcontroller  Fraiwan, L.; Lweesy, K.; Bani-Salma, A. Mani, N, A wireless home safety gas leakage detection system, Proc. of 1st Middle East, Conference on Biomedical Engineering, pp.11-14, 2011. Keywords: rainfall detection, rain sensor, buzzer and alarm system. rather than providing multiple choices. The sensor modules used may only be suitable for use with the matching controller so it is wise to read the specifications to make sure the unit suits your application. Palaparthi.Jagadeesh Chand. Associate Professor in ECE Department, Nimra Institute of Science & Technology, Vijayawada, A.P. Module 5 Fire and Emergency Alarm System Part I- Basics 1 This module will describe: 1. Components and the arrangements of components in fire and emergency alarm systems. 2. How these systems work. 3.